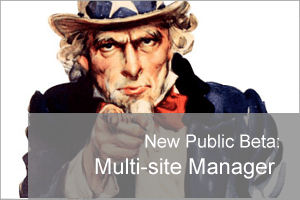 BackupAssist ‘Multi-site Manager’ Beta – We need you! Are you an IT support company? Currently managing more than two BackupAssist customer installations? It’s quite likely you’re already familiar with BackupAssist’s Centralised Monitoring Console (CMC),a web-based service for monitoring multiple BackupAssist deployments. First launched back in 2010, the service has proven incredibly popular, continuing to save the sanity of many a technician by eliminating the need to wade through individual customer backup report emails. However, while it works great for monitoring, we’ve seen lots of demand to take this functionality a step further and introduce an element of control to it too. Instead of continuing to develop the CMC, BackupAssist will soon be launching a more scalable, more user-friendly and more feature-rich ‘Multi-Site Manager’ to provide all of the centralised reporting and control you could wish for as an administrator. A public beta version is now available and as your feedback is a hugely important part of the development process, if you can spare the time to install and test it we’d be very grateful.